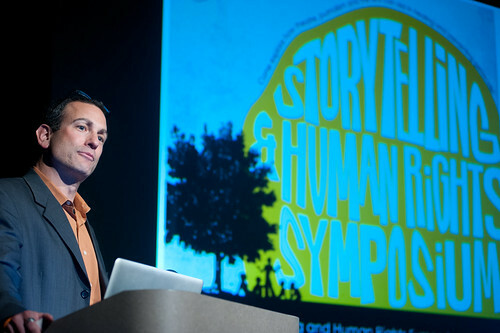 Drew Kahn gives the keynote speech during the Storytelling and Human Rights Symposium on April 12. Point Park's Honors Student Organization, United Student Government and Global Solutions Pittsburgh welcomed the University community to the Storytelling and Human Rights Symposium on April 12. "I love interdisciplinary events. It proves that our different majors are all parts of a whole," said Isabella Alexandratos, a senior English major and Honors Student Organization president. Held on campus, the symposium began with opening comments from Drew Kahn, theater professor at Buffalo State College and director of the Anne Frank Project. Kahn spoke about historical and contemporary human rights violations and discussed how theater, journalism and the arts can aid in healing and preventing genocide. "Tell your story and stop waiting," said Kahn. "You are a doing generation. It's time for you to be an action tank and not a think tank." Senior English major Amanda Schutzman said she she chose to attend the symposium because she was intrigued by the idea of using storytelling as a learning experience. "Mr. Kahn brought a unique perspective that was both eye-opening and inspiring," she said. "We all have a responsibility to stand up for human rights." Justin Karter, a M.A. in journalism and mass communication student and Honors Program graduate assistant, agreed. "Humans are storytelling animals, and we make our choices based on the stories we choose to believe about ourselves and our relation to the world," he said. Following Kahn's presentation, Annie Siebert, a reporter for the Pittsburgh Post-Gazette, and Point Park Assistant Professors Karen Dwyer, Ph.D., and J. Dwight Hines, Ph.D., led a panel discussion and workshops with students to create a skit, story or a piece of art that described a particular human rights violation. Kahn concluded his remarks with a challenge to Point Park students. "I want you to figure out what your story is to tell," he said. "And when you tell it, tell it with vibrance and passion."